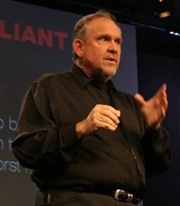 Larry Brilliant's InSTEDD: Can the Internet help stop pandemics? To build a powerful new early warning system to protect our world from some of its worst nightmares. The system should be transparent, with basic information freely available to everyone, preferably in their own language, and will be housed in a neutral country, independent of any single government, any single company, any single UN agency, but will offer its alerts, data, access to all. Brilliant (picture left) pointed to an existing Canadian system, GPHIN, as the nucleus that could form the basis for what he dubbed INSTEDD, for International System for Total Early Disease Detection (of course, the TED in the word is a hat-tip to the prize). GPHIN, he said, "detected SARS and other epidemics and disasters in time to help the world respond and contain them". Quite a statement – Brilliant added that the system is now being applied to avian flu. GPHIN stands for Global Public Health Intelligence Network. It is a web-based system, now in its second version, that continually scans thousands of online information sources (media, local newspapers – often the first source – wires, public statements, health bulletins, blogs) in seven languages (English, French, Spanish, Arabic, simplifiied and traditional Chinese, and Russian) looking for news of infectious diseases outbreaks, other pathogens, natural disasters, and more. GPHIN was established by Health Canada's Lab Centre for Disease Control, in cooperation with several other entities. Basically, it is a sophisticated Internet search engine, based on technology developed by a Canadian firm, designed to crawl the network, filter the information for relevancy and patterns, detect early signs of a potential problem and flag them. The flagged data is then sent to public health experts to be analyzed, including officials at the World Health Organization, at food inspection agencies, and others, who are responsible for verifying the threats and confirming or deny the outbreak (the public right now does not have access to the information, in order to avoid rumors or panic). Being based on data and information that resides on the Internet, the system may look unreliable (if an information is not online, GPHIN won't capture it). But an increasing quantity and quality of information is becoming available on the web, including that originating in the most remote corners of the world. And consider the alternative: reports of outbreaks phoned in or faxed in by local public health officials, who may have only a partial view of what's going on, can be subject to political pressure to suppress the information (to avoid scaring away tourists or businessmen, for example) or may delay reporting because they're overworked. This last point – speed – is crucial, and is at the core of Larry Brilliant's approach (and of the Internet's contribution). Brilliant is a man of many lives. He co-founded the Seva Foundation, which helped cure blindness in millions of people in Asia and promote public health elsewhere. He played a key role, while working at the World Health Organization, in eradicating smallpox in India. He took part in the birth of "The Well", probably the most iconic virtual community. He started several tech companies. He hung around the Grateful Dead. And more. And one month ago was named as the head of the Google Foundation, the philantrophic arm of the company that everybody knows. A quite extraordinary biography that he summarizes as follows: "I'm the luckiest guy in the world: I got to see the last case of smallpox in the world, and recently in India I may have seen the last cases of polio". In the 1960s nobody thought that smallpox could be eliminated, but twenty years later it was practically gone. How did it get eradicated? "Mass vaccination was not sufficient", Brilliant said at TED, "early detection and early response are key". At the conference he told of his experience in India: thousands of people were dispatched from village to village, knocking on every door showing pictures of kids with smallpox and trying to identify cases – and isolate them immediately, what Brilliant calls "create a circle of immunity" around them. That's what worked then – casting the wider possible net to gather information early, and react immediately – and that's what may work again, with the help of technology, against the "nightmare diseases" of tomorrow: SARS, avian flu, and other possible global pandemics. 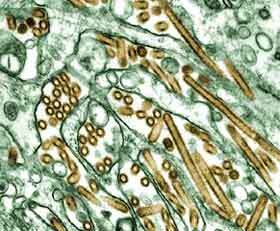 Consider the most actual scare, bird flu, a lethal strain of which (H5N1) has spread around the world in the last two years sparking fears of a pandemic (the microscope image on the right, from the nat geographic, shows the virus - appearing in gold – growing in cells, which are pictured green). According to data from the WHO (updated 21 march 06), 184 people have contracted the virus, of which 103 have died, 42 in Vietnam alone (see the BBC's map of outbreaks). Cross-infection from birds or other animals (cats in Germany and dogs in Central Asia have also reportedly been affected) to humans is very rare. It has only happened where people have been in very close contact with infected birds. And the virus has not yet jumped from human to human. But "if the disease mutates to human-to-human transmission, the world as we know it will stop, there will be no airplanes flying", said Briliant. He did a private survey of epidemiologists: 15% said that they thought there would be a pandemic of bird flu within three years; 90% that it would happen in the next two generations, making one billion people sick. There are no vaccines for bird flu yet. And global mobility makes the spread of diseases easier. So the only response goes back to the village-to-village smallpox strategy: early detection and early response. The key with these diseases, he told the San Francisco Chronicle, is "you find them early and kill them before they spread". GPHIN monitors infectious diseases – not just in humans, but in animals and plants – and also tracks chemical incidents, radioactive exposures, dangerous products and natural disasters. The system also tracks “remedial” measures adopted by countries or by public carriers, such as airlines, to protect travelers. More than 40 per cent of WHO information on potential public health risks comes from GPHIN – information which, when tested with member countries, usually proves accurate. According to Mawudeku, GPHIN retrieved the first suggestive report on SARS in November 2002. It was an article in Chinese on how an unusual number of otherwise healthy people were visiting hospital emergency rooms with acute respiratory illness symptoms. That information was disseminated to public health authorities. A month later, she said, another article in Chinese was identified on how a large number of people in China’s Guangdong province were falling ill. The system was further developed into GPHIN2, after which Brilliant would now like to model the "total early disease detection" system he envisioned at TED. The idea is to turbocharge GPHIN2 by expanding the search and analysis capabilities, the number of news sources tracked and the languages covered. Satellite data could be mashed up with the GPHIN data to help confirm reports rapidly; and so on. The system could also be used to detect early signs of famine, environmental degradation, water poisoning, toxic spills, bioterror, exposure to nuclear agents, and basic information should be available to anyone. "The goal is to have the earliest possible warning of all bad things (…) and contain them with early response", he told Wired. That's quite a challenge. Technological – Brilliant's new closeness with Google will be helpful for that, and many other companies and people have indicated support – as well as political and social, for INSTEDD will create unprecedented transparency in the very sensitive field of public health, and may end up enlisting many people as both audience and source of the information. Brilliant is aware of it: he closed his speech in Monterey by describing the system as "a moral force for the world". A group of TEDsters is now working with Brilliant on this, so there will be updates and more posts on this coming (by now you probably figured that I am quite enthusiastic about this project). Comments/suggestions? I wonder if there are some ideas to learn from this proposal. For instance, could GPHIN be missing a “high touch” human approach in its predominately “high tech” monitoring (although they do of course also use humans to analyse software results)? Remember the shock realisation of US intelligence post 9/11 that they didn't in fact have any meaningful on-the-ground intelligence, it was all hi-tech electronic whisperings that didn’t help them really understand what was going on. So could GPHIN use a network of human listening posts, co-ordinated by electronic comms, on the ground in key regions and listening out for physical rather than digital whispers/gossip/stories/patterns/trends, etc. All of which gets added into the GPHIN database to be analysed by their software. (You can get quite sophisticated semantic analysis software these days to spot patterns within free text speech taken from depth interviews for instance). Just wondering if sometimes that would catch stuff the other system would miss, or catch it sooner. Unless of course there's such confidence that GPHIN electronic monitoring can spot everything that needs to be spotted. I also wonder if there should be some kind of incentive in place for the public to actively keep a lookout for and report information. For instance, would people be encouraged to send in suspicious signs that could lead to a disease being spotted early if every legitimate posting was automatically entered into a draw for a monthly cash prize. Perhaps the danger of too much low-quality clutter outweighs this approach, but the right incentive to galvanise people into being an active part of the alert system makes sense to me. suspicious signs of outbreak costs 50p, or whatever, and that revenue gets split between GPHIN and mobile operator. (With the right incentive people happily pay money to participate in a chance of winning, e.g. the lottery). Finally, I definitely think that mobiles are the key to any consumer-based input device. What if people could just text, say, ALERT to a number, then perhaps get into an auto text response mini multiple choice question and answer session to determine the typology of disease warning, etc. (Their mobile’s geographic location should automatically be part of the information). Andy's point about adding a "human intelligence" (humint) layer to GPHIN's "techint" (intelligence gathered using technical means) is an interesting one. For most people humint is synomymous with spies and clandestine activities, and it may actually be that some of the GPHIN information-gathering may have to happen in some covert way (think of the way the Chinese government tried to keep SARS "secret" for some time). But here it would be about finding a way - through a balanced use of incentives - to expand the number of sources, so that the outbreaks-monitoring net can be expanded and the overall speed of the process increased, without creating too much clutter. More comments? In 2001, Jacob Ogebe, a field officer for the Carter Center Guinea Worm Eradication Program, was trying to track down every pond in the area surrounding Ogi. He treated each with Abate, a mild pesticide that left the water potable, but killed the microscopic fleas that carry Guinea worm. But slowly, he realized that Ogi's villagers were misleading him. He heard rumors of a sacred pond, but no one would take him to it. (...) The villagers say they believe that the souls of their ancestors also dwell in it (...). After Ogebe found the pond, he said, villagers tried to dissuade him from treating it. "Some of them offered me money to hide it," he said. "But I told my boss at the Carter Center. Then each time I went to the village, people followed me around. There were threats on our lives." (...) "They refused the Abate," he said, adding with a grin: "But someone killed a dog and threw it in their sacred pond. People stopped drinking the water - and Guinea worm cases went down." GPHIN is somewhat automated and somewhat rules-based, but still relies on human intervention for all necessary response. A truly resilient system would go further, connecting more network nodes -- such as hospitals, public health agencies and pharmaceutical companies -- and anticipating and automating responses based on a range of contingencies. Nevertheless, it's encouraging to see so much effort -- and so much leading-edge thought -- focused on networked IT systems and their potential to meet critical public needs. This is the seed of resilience. Progress depends on -- and is driven by -- collaboration. The greater the number of contributors, and the greater their insight and ambition, the faster we will make progress toward a truly resilient response. UPDATE 6 April 06 - Putting avian flu on the map. for the earliest possible detection of new outbreaks of bird flu, novel diseases like SARS and ebola, as well as new emerging biological threats, whether bio-terror or bio-error - and extending to famine, flood, natural disasters, chemical and industrial spills, forced migration and other catastrophes where time is of the essence in responding. The world would not today be playing catch up with new pandemics if we had such a system in place 30 years ago; governments would not be able to hide cases of bird flu or genocide, they would not be able to delay reporting cases of polio and the world would have an entirely different view of emerging new communicable diseases if such a system were operative. Latest news, Google, the Omidyar Foundation and VC firm Kleiner Perkins have pledged support, and many individuals around the world have done the same (there is room for more). UPDATE 8 March 07 - Status report at TED07, one year later: pilot project coming up soon. When Larry and his team at Google.org talked to the disaster community about his wish, they told him simply: In a disaster, "We've got to be able to find each other." Their needs broadened his vision. Now, along with early detection, his system will offer disaster-relief agencies a way to communicate and share data, to provide coordinated early response to disasters. The system is called INSTEDD (International Networked System for Total Early Disease Detection). In March 2007, the new system undergoes its first pilot project, Working with the Rockefeller Foundation and NTI (Nuclear Threat Initiative), six countries along the Mekong River (Vietnam, Thailand, Cambodia, Laos, Myanmar and the Hunan region of China) will do a tabletop exercise about how they would react to a pandemic flu. INSTEDD's goal is to become a trusted source of comprehensive disaster tracking and response tools that enable users to operate more effectively in times of crisis; and, more than that, to foster a community of individuals, nonprofits, companies and government agencies involved in the detection of, and response to, public threats. (...) An INSTEDD board was formed: Larry Brilliant: Executive Director, Google.org; Peter Carpenter: President, Managing Director, INSTEDD; David Heymann: Executive Director, Communicable Diseases, WHO; Tara O'Toole: CEO and Director, Center for Biosecurity of the University of Pittsburgh Medical Center. (...) Says Mark Smolinski, Threat Detective at Google.org: "We don't even have standards on how we collect basic information on human demographics or health info during a disaster. That's something that an organization like INSTEDD could help promote." It has been almost exactly one year since I began my work at Google.org. We've been in a bit of a quiet period during that time, meeting with foundation leaders, activists, NGOs, and scientists -- and Googlers -- from all over the world. My major task has been to build a world-class team, comprised of experienced Google managers paired with content experts from the fields of climate change, global public health and economic development to spearhead strategic initiatives for our philanthropic efforts. There were four of us one year ago; today we are 25 people. (...) So where are we going now? Google.org is looking to better understand the inextricable linkages among climate change, global public health and economic development, and the impact of global warming on the poor. We want to fund projects that are making a difference and that are effective on a large scale. We live in very complicated times. Global health, poverty, and climate are inextricably interrelated, and it is the poor of the world who bear the heaviest burden. Google.org is focused on learning initiatives that simultaneously fund good organizations working in these areas and provide insights into "big ideas" that could be scalable from these pilot projects. Kleinberg was becoming an expert on local disaster-preparation efforts. During her term as Palo Alto's mayor, preparing a city emergency response plan was a priority. At her urging, Palo Alto took the lead in Santa Clara County. She helped launch Joint Venture's response initiative and she has been involved in statewide discussions. So when INSTEDD Director Peter Carpenter was looking for someone to get the start-up started, he thought Kleinberg would be a natural. But she wasn't so sure. (...) Tuesday, she was at the United Nations with other INSTEDD folks, enlisting U.N. agencies in their efforts. The company has $2.5 million from Google.org this year to get off the ground. The staff members, some of whom work pro bono, are dispersed around the world. Kleinberg keeps the virtual operation running from her one-woman office. One of her first priorities is to change the company's name, a tortured acronym designed to refer to the TED prize. "I'm sure we can come up with something better," she said. UPDATE October 07 - Eric Rasmussen becomes CEO of InSTEDD. InSTEDD is an innovation lab for technologies designed to improve early disease detection and rapid disaster response. Disease and disaster are usually viewed as separate topics, handled by different agencies and specialists. But there is no humanitarian crisis that does not have a health component, or a serious outbreak of disease that does not have a humanitarian dimension. According to a recent Oxfam report, there has been a four-fold increase in the annual number of natural disasters. Increased trade and travel, high-volume livestock and poultry operations, a shifting climate and a burgeoning human population have also led to a disturbing global increase and spread of newly identified pathogens (HIV/AIDS, SARS, hantavirus), a resurgence of familiar plagues (TB, malaria, polio), and the emergence of deadly new strains (H5N1 avian influenza, West Nile virus, antibiotic-resistant staphylococcus). Mortality statistics only begin to tell the story. The costs of a disease outbreak or a natural disaster are devastating for families, communities and countries. AIDS leaves children orphans. Floods, fires and earthquakes destroy homes. Disease outbreaks cripple food supplies and ruin livelihoods. InSTEDD works with universities, corporations, international health organizations, humanitarian NGOs and communities. Together, we work to identify or craft and then field-test technologies for better data collection and analysis, more efficient communications, and more effective response. InSTEDD will, for example, be adapting new social networking capabilities for humanitarian coordination, and testing inflatable satellite dishes able to be carried in a backpack. InSTEDD’s mission is to discover, develop, test, deploy and share information about technologies that buy critical time. Through better disease detection and response times, outbreaks can be contained and possibly prevented. Through better disaster response, more lives can be saved. Through collaboration better answers can be found. The InSTEDD technology field lab page, with descriptions of some of the tools they're testing, is here. Google.org had compiled a list of over 1,000 ideas. These were reduced to 11, focused on the world's “biggest, most imminent, least well resourced problems”. Each of the 11 was allocated to a different member of the Google.org team, who acted as its advocate in a process of further scrutiny and selection that Dr Brilliant likens to being in court. This led to the five initiatives announced this week. In these deliberations, the focus was on what Google specifically had to offer in each area, given its technological and engineering capabilities, mastery of information, entrepreneurial culture and global reach. In broad terms, the outcome is not terribly surprising. Google.org will pursue five “core initiatives” in three areas: fighting climate change (a particular obsession of Messrs Brin and Page); economic development (a passion of Sheryl Sandberg, the unseen driving force behind the creation of Google.org); and building an early-warning system for pandemics and other disasters—something Dr Brilliant wished for when he won the 2006 TED Prize, which first brought him to Google's attention. Accordingly, Google.org has made a $5m grant to InSTEDD, a non-governmental organisation that is building a rapid-reporting platform to connect people on the ground with those monitoring pandemics. It hopes to raise the quality of public services in poor countries by improving the flow of information both to those who run them and to those they serve. It has big ambitions to help small and medium enterprises in developing countries. It is investing in the development of a plug-in electric car. And it has launched a project called RE<C to develop renewable energy that is cheaper than coal, “within years not decades” here. UPDATE 5 March 08: InSTEDD update breakfast at TED2008: Building the technologies of outbreak containment and humanitarian action.